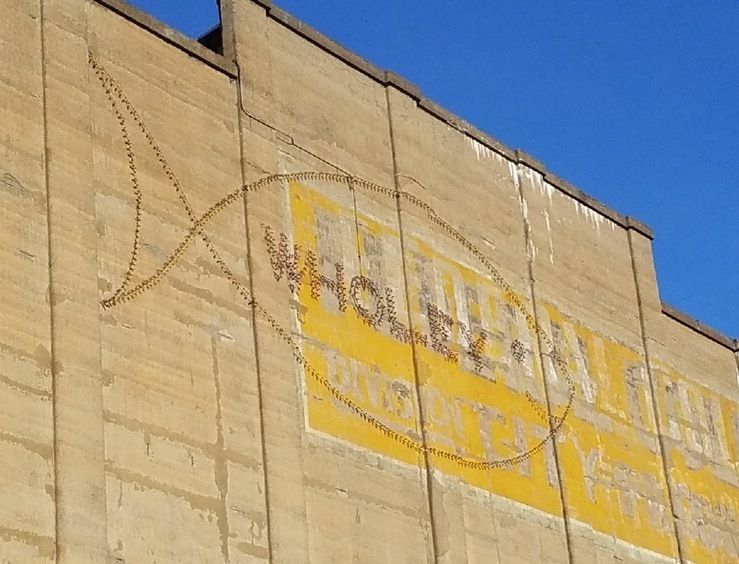 At least for now, the beloved fish still remains on the side of the former Wholey's cold storage building. Photo by Tracy Certo. 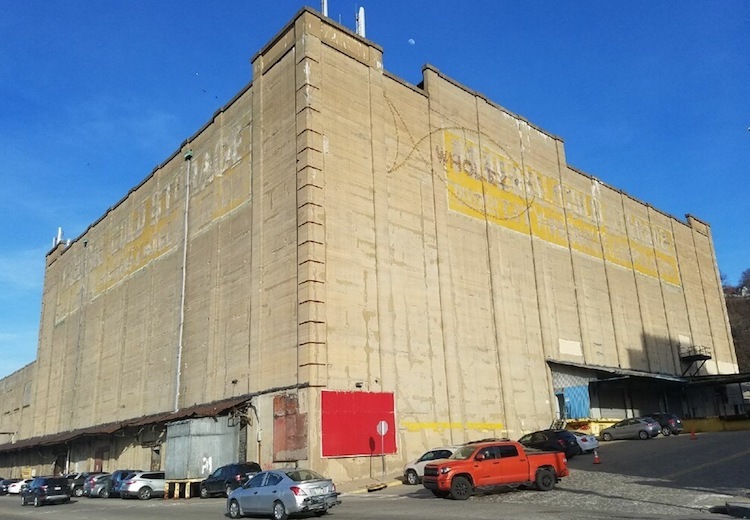 To locals and seasoned Strip District visitors, it may always be the Wholey Building — that imposing concrete warehouse with a smiling neon fish blinking from the wall above 15th Street. 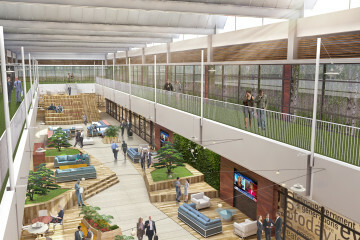 But marketing materials developed by CBRE, with a design by Desmone Architects, show the potential for chic offices with walls of windows above five floors of parking at 1501 Penn Ave., creating the “front door to Robotics Row” in one of Pittsburgh’s most sought-after neighborhoods. 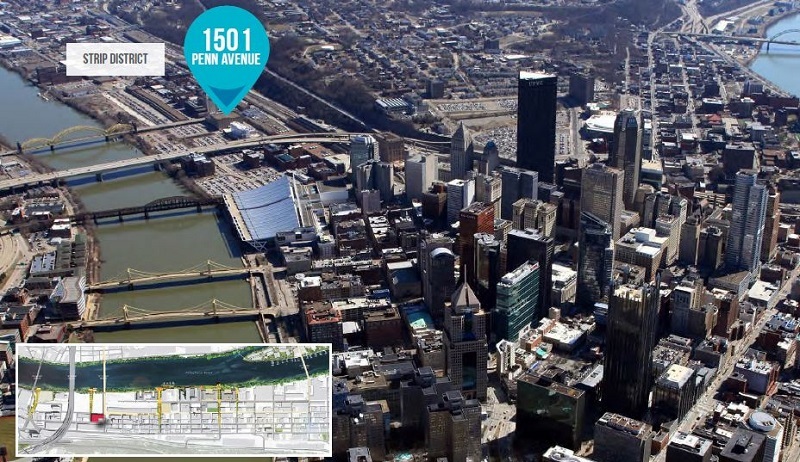 In The Strip, because of Pittsburgh’s growing high-tech workforce, commercial leases can cost $30 or more per square foot, well above the $24 asking rate for Class A space in Downtown and its fringe neighborhoods. If a developer follows CBRE’s suggestion to convert the Wholey structure into offices above a garage, it could cost from $40 million to $100 million, depending on the number of floors, says Kyle Prawdzik, CBRE’s vice president for investment properties. The Strip became a tech-driven submarket after Pittsburgh’s high-tech workforce grew by 79 percent over the past decade. With tenants such as Uber, Argo AI, Apple and others, all the way to Carnegie Mellon University’s National Robotics Engineering Center in Lawrenceville, The Strip has become the epicenter of Pittsburgh’s robotics and autonomous vehicle engineering industries. The Uber Advanced Technologies Group, located in a former food warehouse, is pioneering self-driving technologies for cars and trucks. Argo AI, a Carnegie Mellon spinoff, recently entered into a $1 billion joint venture with Ford and has leased a headquarters office for self-driving technology research. The site has GT-B zoning and could be the “front door to Robotics Row,” says CBRE. The Wholey property’s prime location at the corner of the 16th Street Bridge puts it in the heart of the Strip, with walkability to the Central Business District. 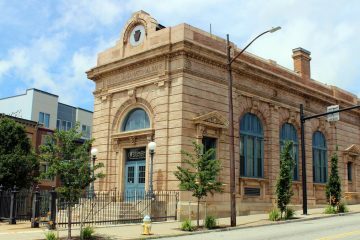 A block away, Chicago-based McCaffery Interests is redeveloping the long-vacant Pennsylvania Railroad Fruit Auction & Sales terminal, and the city has proposed a “smart street” redesign for Smallman Street. In addition, more than 800 apartments and 46 townhomes are under construction in the Strip. 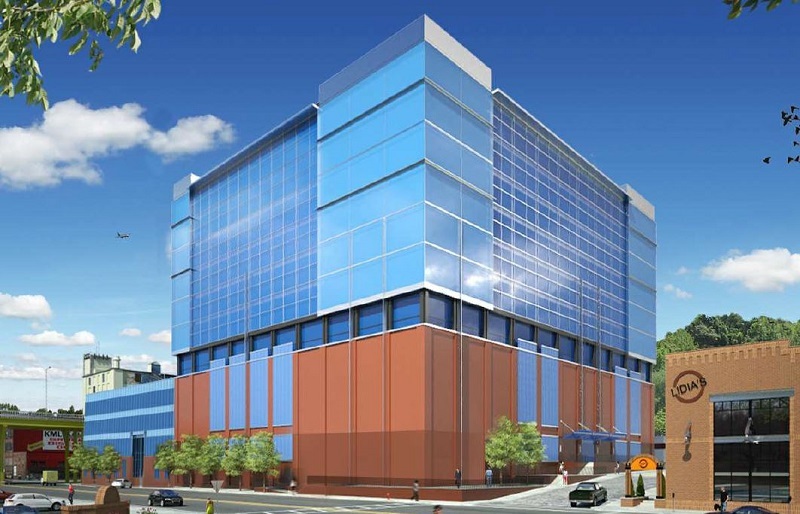 A Desmone Architects rendering of the Wholey Building’s potential as an office tower. Courtesy CBRE. A seafood cold storage facility until the Wholey family sold its wholesaling business, the building has the potential to be “the most identifiable building and commanding presence in the Strip District because of its GT-B (Golden Triangle Subdistrict B) zoning,” says Prawdzik, who is marketing it on behalf of owner Sampson Morris Group in Monroeville. At 336,000 square feet, it is one of the largest available properties in the Strip, with frontage on 15th, Penn and Smallman. Sampson Morris, developers of commercial and residential real estate, purchased the building and its 1.3-acre lot 10 years ago for $2 million, according to Allegheny County property records. Over the years, Sampson Morris proposed rehabbing it for offices, condos and apartments, but the building has remained vacant. In addition to the main building with seven floors, there’s an annex with two floors of double height. The main building has no windows and its walls are 3.5-feet thick, giving it exceptional load-bearing strength. As a garage it could accommodate 485 parking spaces, CBRE says in its marketing brochure. Wholey’s LED light fish. Photo by Tracy Certo. Besides the GT-B zoning, the site has other competitive advantages such as uncongested access and egress and direct mass transit services, CBRE is telling potential developers. Already, the sale offering has drawn “a very large response from our clients all over the country,” Prawdzik says. As for the lighted fish: It would be up to the new developer whether to keep the art installation as part of the building or remove it, Prawdzik says. The Wholey family has been looking for replacement sites for the string of LED lights and is open to suggestions. Any ideas? Let us know in the comments below.